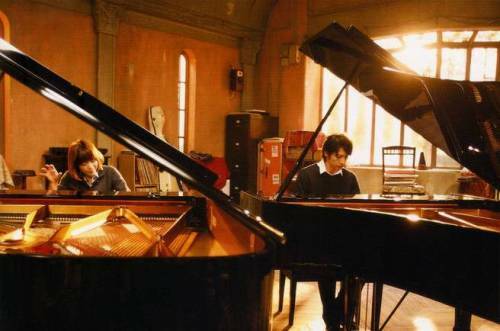 Based on the Japanese manga written by Tomoko Ninomiya, Nodame Cantabile is a funny and quirky romance between two students at Momogaoka College of Music. Our lead male character is Shinichi Chiaki, son of a world-renowned concert pianist, who studied abroad as a youngster at the musical capitals of the world. The top student at Momogaoka, he is a pretentious multi-lingual snob who harbors ambitions to become a famous conductor. Switch over to his female counterpart, Megumi Noda, better known as “Nodame”, who is a messy and gluttonous slob. Despite being a talented, albeit lazy, piano student at Momogaoka, Nodame dreams of becoming a kindergarten teacher. These two characters encounter one another very much by accident. For our Nodame, it is love at first sight, but it takes longer for Chiaki to even begin to appreciate her quirky qualities. Their relationship causes them both to develop and grow – opportunities open up for the two as they begin to take risks and cause them to push themselves harder than they ever thought they could. Let’s start off with my long-winded analyses as to why I like this drama. In all seriousness, Nodame Cantabile is not one of your cliché romance dramas. Whereas most conventional dramas tend to have the love story as the central plot, Nodame Cantabile instead focuses on the musical journeys of the characters throughout college, with the romantic relationship being mostly a sub-plot. Indeed, it’s only about halfway through the story that the romance really begins to have any notable influence on the plot itself, when it had only previously served as a means of comic relief. This is precisely the reason why I particularly enjoyed watching this drama before: there is very little romantic tension (we can figure out from the start that Chiaki and Nodame are eventually going to be together) and we can really sit back and relax without biting our nails off in anticipation for the next plot twist (because there are NO plot twists!). Sure it’s ridiculously corny and cheesy, but it doesn’t become emotionally sappy. It’s a very light-hearted drama to watch. 2. It’s impossible to hate any of the characters. Our two main characters are Chiaki and Nodame. When we are first introduced to Chiaki, he’s depicted as a stuck-up snob who looks down on everybody in the school who criticizes every note anybody plays. Nevertheless, everybody swoons over him for his musical talent (and dashing good looks) and he is often tailed by a throng of admirers. He seems like a jerk, doesn’t he? I have to admit, I thought so too when I first began watching. However, he’s a character that, despite how stupid he acts, we just can’t bring ourselves to hate. We understand that his pride is justifiable – he’s the son of a world-renowned concert pianist and he’s the top student at his college! We also feel sympathy for him – Chiaki has aspirations to study abroad and become a famous conductor but is hopelessly mired in Japan after a plane accident as a child left him with a crippling phobia. As the story progresses, we begin to see more of Chiaki’s good qualities – we see his compassion, his ability to bring out the hidden potential in others, and his awesome cooking abilities. Of course, the reason why Chiaki undergoes such a change is because of Nodame. She is depicted rather awkwardly – our first encounter with Nodame is when she steals her friend’s lunch, an act that we learn is rather routine for her. Her room is extremely messy (indeed, if seeing validates existence, then I can say that her floor does not exist) and she often goes several days without taking a bath. It is much to Chiaki’s horror when he finds out that he lives next door to this slob-of-a-girl; he takes command and cleans out her room (not once, but multiple times). While our initial reaction to Nodame is confusion and probably disgust, we soon realize that Nodame is a very cute (read: ditzy) girl with a prodigal skill for piano. Most of the characters in this drama, when first introduced to us, are illustrated much in the same format as Chiaki and Nodame – they are first illustrated in a ridiculously awkward or embarrassing light, and as the plot progresses, we see more of these peoples’ actual personalities. This juxtaposition, in fact, is the magical reason why we love all – yes, that’s right: ALL – the characters that appear in this drama (there are a few annoying characters that pop up but we can’t bring ourselves to hate them). This formulaic composition of characters makes for a very light-hearted plot that is fun to watch. 3. It’s only 11 episodes long. This is pretty much self-explanatory. In a day where the average length of a drama is around 40 episodes long, having one that is only 11 episodes long seems like a breath of fresh air. 4. The soundtrack is pure awesomeness. Every time that I remember that this drama was originally based off a Japanese manga, it always leaves me scratching my head. A large part of this drama is the musical performances that take place – Chiaki conducting student orchestras, Nodame entering a piano competition, the list is endless – and somehow the original manga found a way to portray the depth of emotion and passion. However, the drama eclipses whatever the manga managed to do: an average of five different classical compositions are used in every single episode, with the most famous ones being Gershwin’s Rhapsody in Blue and Rachmaninoff’s Piano Concerto No. 2. Being a large classical music geek myself, I found that I could really appreciate incredible choice of pieces that were used to make up the soundtrack for this drama. 5. It’s funny. This is a really light hearted drama to watch. While most of the stuff that happens in the story is ridiculously corny and cheesy, we find it funny since we recognize them as being minor exaggerations of things that happen to us on a daily basis. Many of the characters are blatant caricatures of people that we once met when we were in school (the swooning cheerleaders, the pervy-old-man, the douchebag kid, the flaming homosexual, etc), and as such, we can relate to it, and laugh along with it. The story does have its serious and emotional moments, such as Nodame’s participation in a competition or Chiaki’s final performance with his orchestra, and I have to admit that I did tear up at a few choice parts (or it could just be that I’m an emotional wreck). However, the drama does a very good job of using comedy to diffuse the tension in these serious parts – almost every time we enter a serious and sobering part, there will be some ridiculous comedic act that leaves us incredulous and laughing. 6. He gets the girl at the end. You know those stories where sometimes you wish that the main character could have been with a different person? Well, that isn’t a problem in this story. He gets the girl and you love it the way it is. All in all, this was definitely one of the best dramas I’ve ever seen. Sure, it’s incredibly cheesy at times, but it was fun and adorable to watch. This entry was posted in Drama Recaps/Reviews, Japanese Dramas and tagged Classical Music, drama, Han Sum, Japanese, Nodame Cantabile, tomoko ninomiya. Bookmark the permalink.